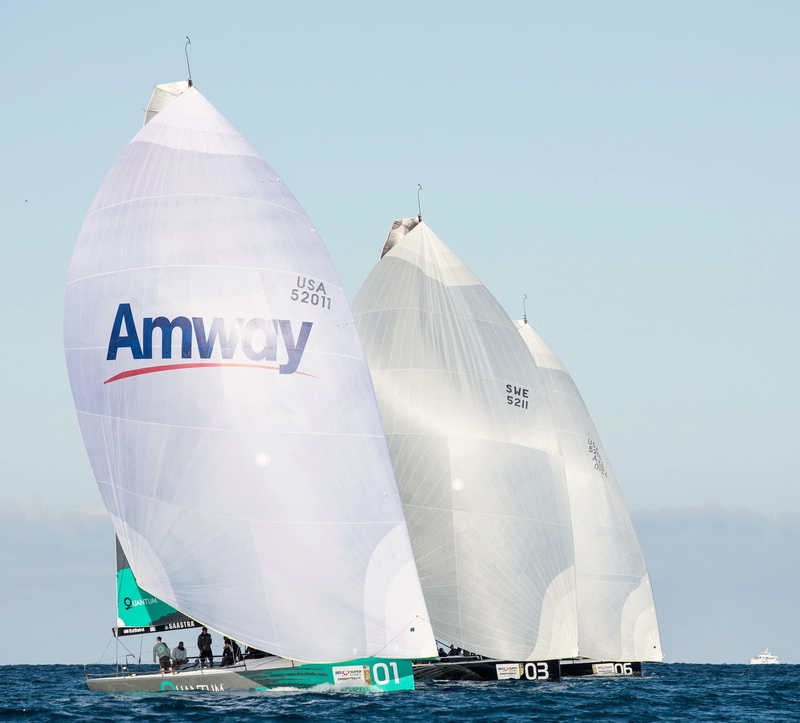 Quantum Racing go into the final day of racing at the 52 US Championship in Miami with a lead of two points after rescuing a valuable third place from what proved to be one of the most tactically testing races yet. 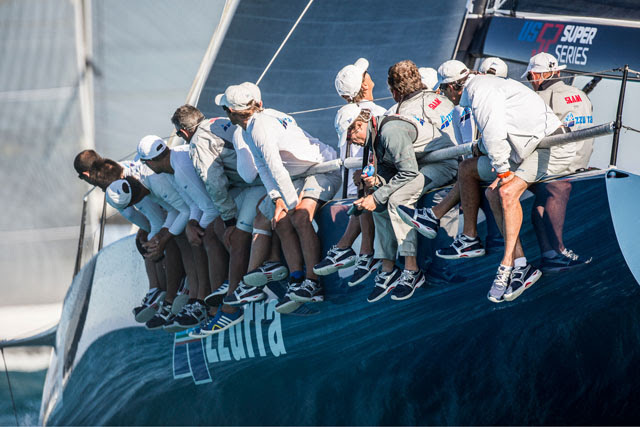 They took places down the final fluky run of Saturday’s only contest to establish slender advantage over rivals Azzurra as they contemplate a finale of up to three races Sunday. A long, hot wait – drifting aimlessly off Miami South Beach for over two and half hours – was rewarded by a very taxing Nor 'easterly breeze of seven to nine knots which contained big wind shifts, subtle pressure differences and consequently many place changes through the seven boat US 52 Super Series fleet. 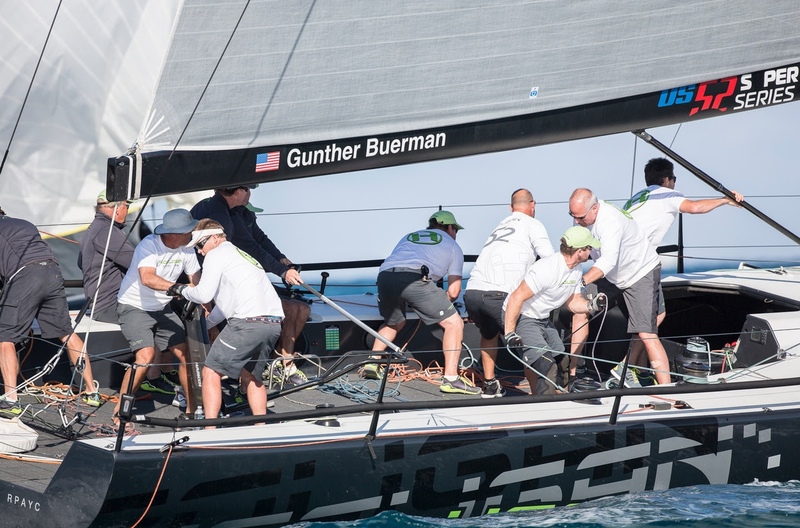 Gunther Buermann’s Hooligan crew proved true to a late night pledge to themselves, that they would win today, seeking ‘redemption’ after a problematic final race Friday. A succession of small mistakes culminated in a gybe in which the running backstay jammed, taking away their aftermost stanchion and dropping three crew into the water. With Kenny Read calling tactics, aided and abetted by strategist Tony Rey they sailed an accomplished, smart race to win their first race ever on the US 52 Super Series. Their precise second beat got them through early leaders Sled, and so Taksashi Okura’s crew were – for the second successive occasion – denied their own 52 maiden race win. “It was redemption for us for sure. Yesterday was quite humbling and we just make a bunch of errors as a group and literally paid for it. We broke the boat, we broke some people, and we decided late last night that ‘we are winning today, we were pissed at how we performed and we all wanted to do something about it. So I give the whole team a lot of credit. It would have been easy to pack it in, and have nothing to play for. But everybody was really into it. My brother Brad got us a great start and that made it a little easier.” Read smiled on the dock at Miami Beach Marina. Starting the day with a cushion of just one point Azzurra’s game plan looked favourite early in the race, working the left inshore lane where there was more pressure. But unfortunately for them it was the opposite side which played out best. Until the second round they were back in seventh, but they too one place on the last run to keep themselves solidly in contention going into the last day. “We had a plan to go left, there was plenty of breeze on the left, there was less current and I was very confident in it. It was forecast to go left. There were many reasons to go left. We were very very happy after the start. But that is part of the game, you have to trust in your plan but sometimes it does not work out. But tomorrow is another day.” Noted Vasco Vascotto, Azzurra’s tactician. It remains close throughout the fleet. Azzurra may be 12 points clear of third placed Interlodge but there are then just two points separating them, Rán Racing in fourth and Sled in fifth.